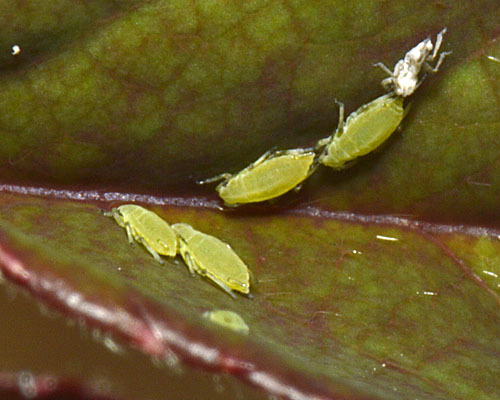 Myzaphis are small elongate-oval dorso-ventrally flattened aphids. The head has a large median frontal process and a short antennal terminal process. The antennae are only about half the body length. The dorsum is sclerotic and ornamented with numerous small pits. The first tarsal joint is five haired. Their siphunculi are rather long and cylindrical with the distal part often curved outwards and slightly swollen. The cauda is tongue-shaped or triangular. 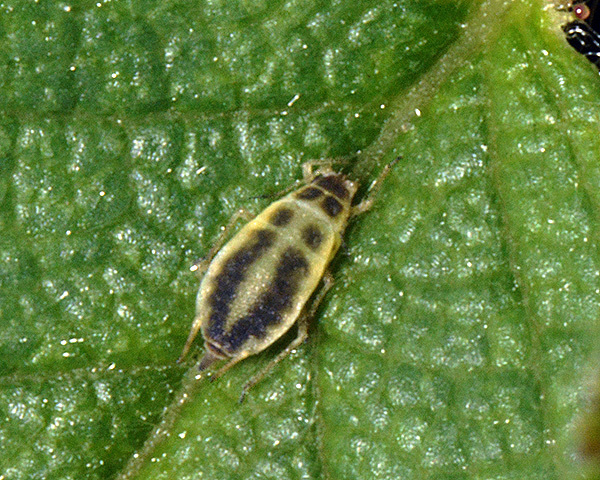 Myzaphis aphids feed on Rosa and Potentilla (the rose family, Rosaceae). There are seven species, six of which are native to Asia and Europe and one to Canada. Two species now have a cosmopolitan distribution. The alates (see second picture above) have rather weak abdominal pigmentation which is usually divided intersegmentally in the midline, with large marginal sclerites on abdominal tergites 2-4 . The hairs on the front of the head are conspicuous. Antennae of Myzaphis bucktoni alates have 14-32 secondary rhinaria on the third antennal segment but none on the fourth. This species mainly occurs on wild roses such as dog rose (Rosa canina) and harsh downy rose (Rosa tomentosa). Myzaphis bucktoni apterae feed dispersed along the mid-ribs of upper sides of the leaves. Sexual forms occur in November. Males are small, dark, wingless and very active. Oviparae are pale dusky olive green and have strongly swollen hind tibiae. Myzaphis bucktoni occurs throughout Europe, Asia and North America. 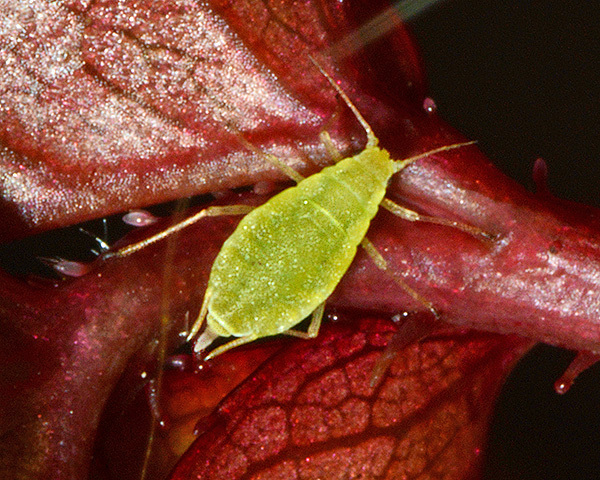 Wingless adults of Myzaphis rosarum are yellow-green to green with no pleural stripes (cf. Myzaphis bucktoni which has a pair of broad dark stripes converging at the level of the siphunculi). The antennal tubercles are low, but the median frontal tubercle is rectangular and strongly projecting (cf. Myzaphis bucktoni which has the median tubercle rounded). The dorsal cuticle is pitted all over. The siphunculi are quite long, and are slightly swollen and dark-tipped. The cauda is long and conspicuous. The body length of Myzaphis rosarum is 1.2-2.4 mm. 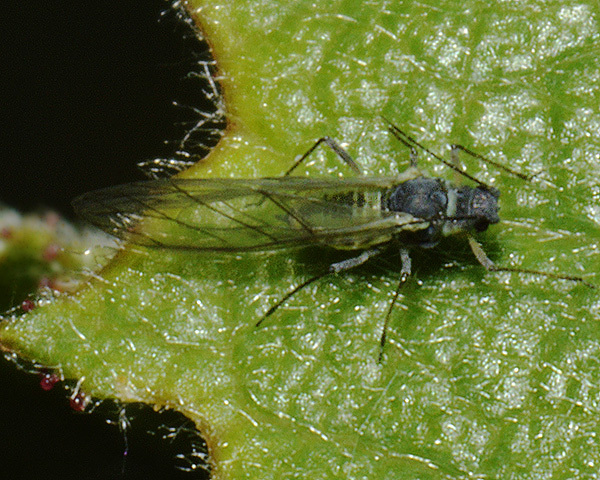 Alates have a dark central patch on the abdominal dorsum. Myzaphis rosarum live all year round on wild and cultivated roses, especially climbers, and frequently also on shrubby Potentilla species. There is no host alternation. They feed mainly along the mid-ribs on both the upper and undersides of young leaves. In Europe oviparae and small dark apterous males appear in November. Myzaphis rosarum is native to Europe, but is now almost cosmopolitan.